At the age of 36, Joe Bonamassa has put together quite the collection of material. With 10 studio albums in the can, several live albums/DVDs, and releases with Beth Hart and Black Country Communion, Bonamassa has certainly recorded some good songs. As a new studio album is set to be released this year, we break down Bonamassa’s top 10 songs to date. “Prisoner” was the album closer on Dust Bowl and is a Barbra Streisand cover. The song saw Joe return to a Strat and features one of his best vocal performances. It’s clear producer Kevin Shirley challenged Joe on the track and Bonamassa rose to the occasion. Hopefully we’ll get the chance to hear the song live some day. One of the standout tracks on The Ballad of John Henry, “Happier Times” has an alluring quality to it that just pulls the listener in. The song has top notch playing, vocals, and a fantastic arrangement. If you ever wanted to hear a song that really displayed Bonamassa’s guitar virtuosity, “Woke Up Dreaming” might be the place to start. The song was recorded for Blues Deluxe and is a highlight of the live show with Bonamassa playing solo on an acoustic. The live performance gives the listener a great appreciation for his playing. “Blue and Evil” appeared on the Black Rock album and opens with an acoustic riff before blasting into a Zeppelin style rocker that would fit great on a Black Country Communion album. Bonamassa’s take on ZZ Top’s “Just Got Paid” has become a staple of his live show and the perfect concert closer. The song flat out rocks and is a great display of Bonamassa’s rock prowess and guitar wizardry. The title track from Bonamassa’s most recent album, “Driving Towards The Daylight” was the perfect choice for a single as his audience continues to grow. Surrounded by world class musicians, including Aerosmith’s Brad Whitford, the song is well crafted and helps push Bonamassa beyond being known as just a great guitarist, but also a strong songwriter. “Song of Yesterday” was written by Bonamassa for Black Country Communion’s debut album and was one of the group’s signature tunes with epic performances from entire band. The track also appeared on the group’s live album, Live Over Europe. “Sloe Gin” was the title track on Bonamassa’s 2007 release and is a cover of the song originally recorded by Tim Curry. The track begins with a haunting intro and features a rip-roaring solo, a must hear tune live. 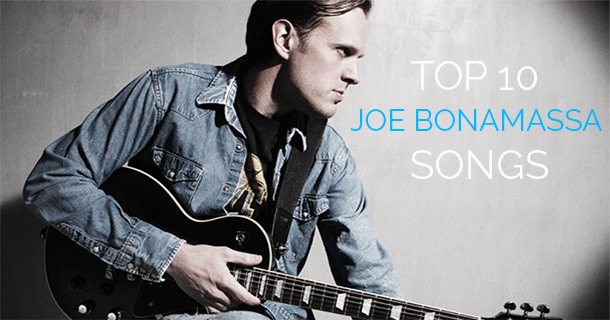 “The Ballad of John Henry” is the song that helped launch Joe Bonamassa’s career to the next level. It was the title track from the album Bonamassa released months before his first performance at the Royal Albert Hall and features his most memorable guitar riff. “Mountain Time” originally appeared on the album So, It’s Like That and clocked in under four minutes. Since then, the song has evolved quite a bit into a ten minute plus epic. The song appeared in its more modern state on Live From Nowhere In Particular and has since appeared on following live recordings. “Mountain Time” is perhaps Bonamassa’s most soulful song with passionate vocals and an absolutely captivating and moving guitar solo that takes the listener to another place. Ottimo sito, ricco di informazioni pertinenti. Lo utilizzerò tra poco pure io. i pretty much agree. 2 through 9 could be in any order, but “Mountain Time” is surely my #1 pick. Good list. …certainly, 10 songs I would definitely have picked, not necessarily in that order. Mountain Time is right on as number one. I was very surprised at Prisoner, I love jb’s rendition. It could inch out Mountain Time as number one, but, I love both of the songs. I would love to hear him record that number again, (that is, if he never does do it live!). He is sounding more and more like PG’s Fleetwood Mac on some of the songs he does. I love JB! I was listening to pandora radio, Black Rebel Motorcycle Club radio and a song comes on; about a minute and a half in, the song kicks into this badass guitar riff/beat/melody and I had no choice but to completely disregard all unnecessary distractions, especially those next to me on the road. I looked down, ran over a couple bicyclists hogging that real narrow far right in which nobody ever seems to drive except me, grabbed my phone, Black Lung Heartache. If that song didn’t make the cut, I’m champing at the bit to hear the songs that did. Blue and Evil was pretty damned good, had to start with that particular track because, well frankly, I’d listen to 4 hours of whale farts if somebody told me it kinda sounds like Jimmy Page playing guitar. Not comparing Blue and Evil to whale farts btw… Zeppelin is the only band with literally no songs that I don’t like at least a little. The author was right about the Zeppelin style in that song though, amazing musician, how have I never heard of this guy? Dafuq? Saw Joe live in Durham this past December 2016. The guy is amazing. If you get the chance, see him live. He is the best there is in the world, bar none. Before you argue with me about that, see him live. You’ll thank me later…..
Have seen Joe on last two tours, going again to see him at Ryman Auditorium (a fantastic historical venue). Am spending more time/money on Joe’s stuff than on Eric’s… Joe … “Always on the Road” … don’t miss an opportunity. Pray that he never burns out! that’s what most of the tourists who have just come back from a trip to Vietnam said. Even though Halong Bay, Nha Trang or Hoi An are the most tourist attractions of Vietnam which have brought thousands of tourists to Vietnam each year, there’s a destination that’s known as the paradise for bikers and especially trekkers, that’s Sapa. brightens up all the mist-wrapped scenery here. If there’s any chance, you can try experiencing their daily works as real farmers of Sapa. you know that the people in Sapa are very optimistic even though they have to work a lot and save every penny. of memories and lessons that you can learn from the lovely locals. will leave you a deep impression and wonderful experience. that’s an awsomes post i have see. Thank you for the shared, i realy like it. Please keep working on it. I am waitig for your new post.